The San Francisco Bay Area is one of the most diverse regions in the United States. More than 30% of its population is foreign-born, and close to two-thirds of its residents under the age of 18 are the children of immigrants. Nearly 250,000 Muslims–one of the highest concentrations of Muslims in the country–live, study, volunteer, work and contribute to the economies and communities of the Bay Area. The One Nation Bay Area project commissioned the Institute for Social Policy and Understanding to provide a better understanding of who is in the community, what languages they speak, what their educational attainment levels are, what their immigration status is, what the levels of employment are, what civic engagement means to them, and to honor their resilience in the face of continued misperceptions about the American Muslim community. This benchmark study provides historical, religious, and cultural context for a community that is often misunderstood and misrepresented – in our schools and communities. 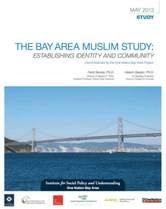 For the first time, this report gathers quantitative and qualitative research about the needs of the Bay Area Muslim community and suggests recommendations for philanthropy, public agencies, and the private sector. Insert your information to download the report.